WHEN SOLZHENITSYN WROTE his great three-volume classic, The Gulag Archipelago, it had a huge impact, particularly in France. There, since the Second World war, a great part of the reading classes had been Communist. Denying that Stalin ran an enormous concentration-camp system was fairly routine – or at any rate it was routine just to say that omelettes needed broken eggshells, and that the prisoners probably deserved imprisonment. Even when The Black Book of Communism came out in France a few years ago, and Le Monde invited comments on the statement that Hitler killed far fewer people than Stalin, there were still a few breast-beaters around to say that, after all, the Communist experience could be excused because it was all part of a well-intended ‘social ex~eriment’. But on the whole. Solzhenitsvn single-hanhedly, through his Gulag book, brought abou; a tectonic shift in French intellectual life. In Anglo-Saxon countries. the effect was less marked – probably, in the first instance, because Russia was that much further away, and because the degree of Communist influence on intellectual life was so much less. There had been indications as to the extent of the horrors under Stalin – Malcolm Muggeridge, quite early on (in 1932), had exposed famine and tyranny in his Winter in Moscow, and there had been memoirs exposing the existence of the Gulag. It was really only after Solzhenitsyn that British and ~mericana cademics started relativising the business – famously claiming that Stalin had onlv killed off a few thousand people, mainly by mistake, for reasons connected with the modernisation of the administration. These people looked verv foolish when Gorbachev came along almost immediately and allowed the realities to be revealed. However, you hit some people with an axe and they do not bleed, and they are still with us, portentously announcing that, no, the actual figure was closer to eighteen don. Anne Applebaum has been a very distinguished student of matters Russian and East European all along. 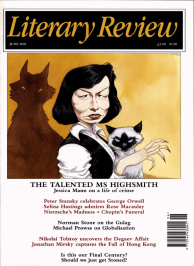 She never fell for the idiotic line peddled in Academe in the 1980s about the Soviet camps, and has now managed the very difficult feat of constructing a new version of Solzhenitsvn’s classic – one with all the furv under control. and reinforced bv source-literature that Solzhenitsyn could not possibli at the time he wrote, have used. Applebaum’s book is an important complement. As with so much else in modern Russia. the hsaster started with the collectivisation of agriculture in 1929. Millions of peasants were simply sent off to a frozen wasteland to build camps and then live in them, ostensibly productively. Kolyrna, &I north-eastern Siberia, had gold, and a huge complex of camps developed there, in an area the size of a small European country, with a filthy climate and mosquitoes that never left you in peace in the summer. The imprisoned peasants were supposed to have been ‘kulaks’, the ‘rural bourgeoisie’ who had resisted the state takeover of their lands, but the whole thmg was a lie. (Moreover. the word kulak did not mean ‘substantial farmer’: it meant ‘usurer’.) Peasants of all sorts resisted the loss of their lands; some starved to death, while others went along with the state, and others still just fled to the towns – fortv million in all. In the first Five Year Plan they were co&cripted to do what migrant peasants have done everywhere as ‘modernisation’ (or just demography) has taken its course – to build. Most countries since the ‘flight fi-om the land’ of the late nineteenth century have become vastly prosperous in consequence, especially the United States. Only under Communism did a flight hm the land mean the imrniseration of the proletariat (and everyone else except the commissars). In Stahn’s time the more unfortunate of these peasants had to migrate, in cattle tsucks, to the Gulag. As everything in the Soviet story does, this all has its antecedents in Lenin. He was a child of the progressive world of the late nineteenth century, and ‘concentration camps’ had their place in that. Isolate the undesirables; teach them social responsibility by placing them in inhospitable circumstances and making them responsible for the consequences. The hopeless cases you can just himanely kill in gas chambers: H G Wells seems to have supported this, and it was part of the progressive tradition (and German geneticists were supported, originally, by American money). Leninism was Progress &vided by Marxism, or the Electrification of Man, and what others had defined as a psychological problem became, for Lenin, a social one. Therefore, concentration camps: and if the inmates died, so be it. The first death camp was Solovlu in northern Russia. Applebaum does not make enough of this but the point of taking the enemies of Bolshevism there was indeed to kill them OK Russians in 1920 were stdl very human people and could not do ths: it took the sending of a special commissar to the place to close down the theatres and discussion groups that any prisoner-of-war camp develops if it is allowed to breathe. Then the inmates &ed in droves (as they were meant to), though at that stage a few managed to escape and tell their story. Death camps were Lenin’s idea. Stahn just put it into practice, on an enormous scale. The bulk of the book concerns arrest, transportation, feeding, work, clothing, survival, revolt and release. The book is well planned around these themes, and the existing literature, memoirs for the most part, has been surveyed in extraordinary width and depth. What can a reviewer say? Every page is a horror story: a woman arrested in her nightgown, hanging out the washing, while her baby howled for his feed; prisoners forced to undress nuns and wash them, because they were crawling with lice on account of not wishing -to take public baths; men licking soot-covered icicles to have water to offset the salty fish they had been given to eat in the transport train; the corpses that gradually emerged from frozen soil, and stank, as the thaw proceeded. Our idea of ‘release’ does not include a side that emerges from Vladirnir Farkas’s account of Hungarian camps: a broken man turned up at his ex-wife’s door, at the top of some stairs that stank of urine and cabbage, hoping to see his small daughter; the door was slammed in his face. Anne Applebaum has immersed herself in the whole gruesome story, and any writer can only be speechless with admiration for her fortitude and her scholarship: she is Solzhenitsyn’s amanuensis, or exegetist. It is not a book that this reviewer could ever have managed to write. but it needed to be written. and the task-could not have been done better. It deserves a prize.